ECRI has pioneered the use of geographic profiling for serial crime analysis, offering both professional geographic profiling systems and advanced training in geographic profiling and related geospatial analysis techniques. 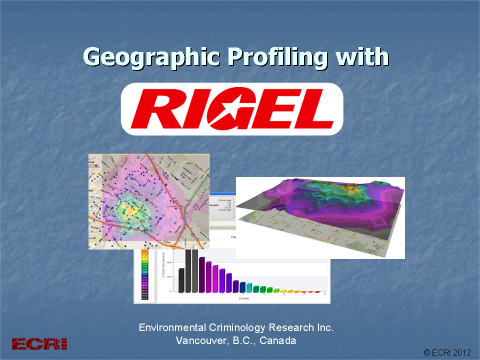 ECRI holds a patent on the CGT method used in the Rigel geographic profiling systems, and has developed many practical refinements over 15 years of experience which help to make geographic profiling fast and accurate. 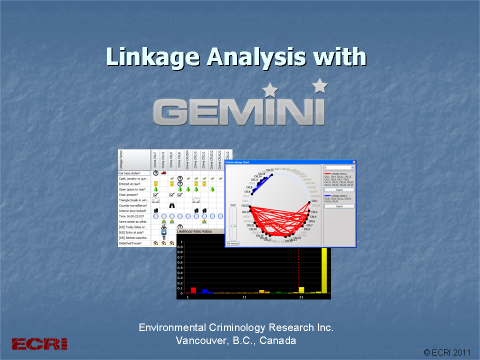 ECRI has developed innovative linkage analysis tools specifically to assist crime analysts and investigators with the critical step of identifying which crimes are part of the same linked series. 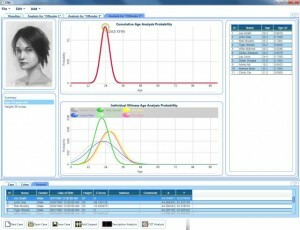 These tools help to ensure the validity and accuracy of subsequent analysis steps such as establishing the correct offender description, identifying patterns, and geographic profiling. It is based on combining the dual methods of matrix linkage and Bayesian likelihood analysis. Evidence-based Suspect Prioritization is the key to focusing investigative resources effectively. It uses Bayesian statistical analysis to combine evidence from different sources in the optimum way to give the highest likelihood results. Applications include witness description analysis, theory-of-crime analysis, and the combination of geospatial and geotemporal analysis results with offender description.